Divorce can undoubtedly be difficult for children and families, and after separating from their partner many women find themselves wondering what mothers’ rights are. It is not a light decision, making the choice to separate and end a marriage or de facto relationship, particularly when there are children involved, and ensuring the welfare of their children is the main consideration for most parents. In the past, the majority of child custody cases favoured the mother, with children perhaps seeing their father on weekends. This is due to old-fashioned ideas about men as breadwinners and women as child carers. Today, courts prefer to focus on shared custody and to establish which parent is the most suitable primary carer, regardless of whether they are the mother or father. The basis of this comes from legislation made in 2006. Mothers’ rights do not technically exist within Australian family law. Fathers’ rights do not exist either. This is because instead of focusing on the rights of parents, the family court instead makes the rights of children its highest priority in parenting cases. Neither parent is treated preferentially and the court bases its decision on its consideration of the child’s best interests. The best interests of the child will be explained in more detail below. The main idea of the Family Law Amendment (Shared Parental Responsibility) Act 2006 is the presumption of shared parental responsibility. This encourages co-parenting and stems from the belief that children deserve to enjoy meaningful relationships with both of their parents, as well as that a parent’s responsibility and duty of care for their child does not change if their marital status changes. 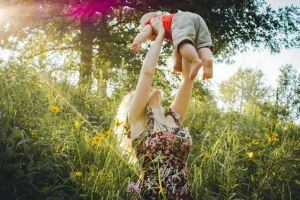 When the proceedings for making parenting orders begin, the court works with the assumption that it is in the child’s best interests to remain connected to both of their parents. Being a mother or a father makes no difference. Parents must show that they are willing to work together respectfully in order to achieve a result that reflects what is best for their child. It is important to remember that parental responsibility is not the same as custody. The parent the child lives with is not necessarily the parent who can make all major long-term decisions for them. These decisions, such as where the child goes to school, medical treatment and cultural upbringing, are part of parental responsibility. When equal shared parental responsibility is upheld, mothers and fathers need to make these decisions together. Holding significant decision-making power for their child’s upbringing and life is part of mothers’ rights. If the child’s father wants to make a major parenting decision with which the mother does not agree, she is able to stop such a decision from going ahead. The second point here is the more important one: if a relationship with one of their parents means the child is subjected to abuse – including exposure to, risk or the threat of abuse – then their contact with that parent will be limited. Children have a right to know and to be cared for by both parents, hence the introduction of the presumption of equal shared parental responsibility. Mothers’ rights to care for their children are therefore dependent on the children’s best interests. During family law proceedings, it is important for mothers to show that they understand the best interests of their children and that they are willing to act to promote their interests and look after their welfare. A parent who exposes their child to abuse has no right to a relationship with that child, as the child’s most important right to be protected from harm. Children should not be separated from their parents unless it is for their own good. Children whose parents have separated have the right to stay in contact with both parents unless this might harm the child. Both parents share a responsibility for bringing up their children and should always consider what is best for each child. Concentrating on the children’s best interests shows that children’s rights are more important than fathers’ rights or mothers’ rights. What Else Affects Mothers’ Rights In Parenting Orders? Although they matter greatly, the child’s best interests are not the sole consideration in determining the outcome of parenting orders. The court takes many other factors into account, such as the parents’ and children’s views. Each case is considered on its own according to that particular couple’s situation. The court can exercise its discretion when deciding how much weight to accord each factor. During the custody proceedings, it is important, as a mother, to keep a focus on the children’s best interests. Women have the right to be protected from violence and to protect their children from violence, including abuse that occurs in their own home due to another family member. To achieve this, mothers’ rights include the entitlement to apply for an apprehended domestic violence order (ADVO). An ADVO is an order that prevents someone from committing future acts of violence against the protected person. These orders are not in the jurisdiction of family law but come instead under criminal law. In her application for an ADVO at the Local Court, the mother who wants protection from abuse by the father or another family member must show that she fears violence, intimidation or stalking committed by the other person and that this fear is based on reasonable grounds. The court will then determine whether the other person’s behaviour warrants an ADVO. The court can specify the period of time for which the ADVO will last. If no time period is specified, the ADVO remains in force for one year. During this time, the defendant against whom the order has been made is bound by the contents of that order. Any contravention of the ADVO will result in a penalty. The maximum penalty is two years in jail. As with order court processes, it may be a rather long wait between the initial application for the ADVO and the final orders. The person wishing to be protected can request interim orders if they urgently need protection. Interim orders are immediately enforceable and will protect the person until all evidence has been heard and final orders have been made. In some circumstances, the court is obliged to make an ADVO, whether or not an application has been made. If the defendant pleads guilty or is found guilty of stalking, intimidation or a domestic violence offence, the court must protect the victim with an ADVO. Many mothers receive full or primary custody of their children. As both parents are responsible for the financial support of their child, regardless of marital status, a mother is entitled to receive payments from her former spouse that go towards the benefit of the child. The child has a right to be cared for by their parents, and this includes financial support, and both parents retain this responsibility when they separate. The Department of Human Services looks after child support. The amount of child support to which a mother is entitled depends on the contributions made by the mother and the father, their current incomes and the amount of time they spend with the child. Child support is money paid for the benefit of the child. Payments made to benefit a former spouse are called spousal maintenance. After a divorce, many women find that they are financially far less well-off than their former husbands, particularly if they spent a lot of time caring for their children. This can affect their future income earning capacity and their ability to support themselves. Mothers’ rights include entitlements to spousal maintenance in situations where it is warranted. Not everybody receives spousal maintenance after a divorce. It depends on one party’s reasonable needs and the other party’s capacity to pay. When a person receiving spousal maintenance payments starts a new relationship, the court will review the spousal maintenance orders and reconsider if the person can adequately support themselves. It is not uncommon for people to wish to relocate with their children after a divorce. This is an important part of mothers’ rights. For example, a woman may be given primary custody of her child and wish to move somewhere else, even overseas. However, the parent the child lives with may not be the only parent who has parental responsibility. In the interests of promoting parental cooperation and privileging the child’s right to know and be cared for by both parents, the family law system encourages parents to come to an agreement together. If the child’s father retains parental responsibility – meaning he must be involved in major long-term decisions regarding the child – and does not agree that the mother and child should move, the mother will then need to make an application for relocation orders to the family court. As with other parenting issues, the court will principally consider the child’s best interests and their welfare. They will balance mothers’ rights with the child’s best interests. This includes factors such as the short- and long-term effects of relocation on the child and the effect of relocation on the child’s relationships with their parents. The court may not make orders in favour of relocation. The other side of this is when the father prevents the child from seeing the mother or removes the child from the country without the knowledge or prior agreement of the mother. The mother can then apply for recovery orders, as part of mothers’ rights. The mother can make an application in either the Family Court or the Federal Circuit Court. This parenting case between Mr and Ms Best took place in Sydney in 2014. The pair had four children and disagreed about the children’s living and contact arrangements with each parent. The children were aged 15, 13, nine and seven years old. The father, the applicant in this appeal, sought sole parental responsibility of the children. He wanted the children to live with him and spend time with the mother. Ms Best, on the other hand, sought that the children live with her and spend supervised time with their father. Previous parenting orders had been made in 2012 and 2013, ordering that the father spend supervised time with the children at a contact centre in Wollongong. He wanted these orders to be reconsidered, arguing for sole parental responsibility in his favour. The father had problems with prescription drug and alcohol abuse and had been verbally aggressive towards the mother. She had previously made ADVO applications for protection from him. In the appeal, the father was critical of the mother’s evidence. However, the judge accepted the mother’s evidence in its entirety. The judged accepted evidence that the father lacked insight into the children’s best interests. The court found that it was in the four children’s best interests to spend no time with the father and to have no contact with him until they turned 18. Orders were made to that effect. The children were to live with the mother and the father was not permitted to contact her. Mothers’ rights can be supported by the children’s best interests. This case from Hobart involved a mother leaving a violent long-term relationship. Mr and Ms Maluka married in 1999 and separated in 2008. They had two children, aged seven and five at the time of the court proceedings. The father had been continually violent towards the mother throughout their relationship and after separation. His behaviour included physical assaults, stalking, vandalism of the mother’s property, intimidation, controlling behaviour and death threats. The mother lived in fear for many years. In his reasons for judgement, the judge referenced the Family Law Amendment (Shared Parental Responsibility) Act 2006 and the emphasis given to protecting children from harm. The father was sometimes physically abusive towards the children, as well as physically abusive towards the mother in their presence. The mother’s case was fast-tracked because of the risk of violence from the father. The mother gave evidence in affidavits and oral evidence in court. An order for sole parental responsibility was made in favour of the mother. The children were to live with her and the father was restrained from contacting, communicating with or approaching the three of them in any way. In this 2012 case from Brisbane, Ms Rafter made an appeal for weekly spousal maintenance payments. This was not the first time she had sought spousal maintenance, having made applications in 2010 and 2011. She sought $1000 per week. Previously, in 2010, she had sought $1350 per week. The husband, however, argued for the dismissal of his ex-wife’s spousal maintenance application, saying that he was unable to pay. The court ordered that the husband pay Ms Rafter $500 per week from the date of the order. There was no specified time period for the payment of spousal maintenance, however, should the parties make an agreement in writing, the order would then be changed. An interesting aspect of this case is the order for backdated spousal maintenance payments. As this was not the first time Ms Rafter had sought spousal maintenance, the court found that she in fact needed spousal maintenance from 2010. Therefore, the husband was ordered to pay her two lump sums as arrears of spousal maintenance. These sums were calculated at $500 per week and amounted to $41,250 and $14,250. The husband was required to make these payments within 30 days of the order. How to get a divorce in Australia if married overseas? Should I Change My Will After Divorce? What is equal shared parental responsibility in Australia? How To Prevent My Children Travelling Overseas? Divorce Property Settlement – How Much Will I Get? Will I Receive 50% of Everything? Do I Pay Stamp Duty To Transfer My Property After A Divorce? Why do I need Family Court Consent Orders?